The dance "Narihira" is the third section of the five-role hengemono "Rokkasen Sugata no Irodori", which was staged in the 3rd lunar month of 1831 at the Nakamuraza. It starred Nakamura Shikan II in the five roles of Sôjô Henjô, Ariwara no Narihira, Bun'ya no Yasuhide, Kisen and Ôtomo no Kuronushi. 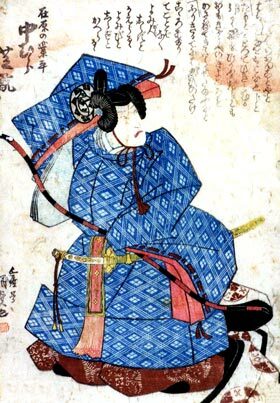 His stage partner in the role of Ono no Komachi was Iwai Kumesaburô II. "Narihira" is performed with a Nagauta ensemble. This is the most romantic section of "Rokkasen Sugata no Irodori", describing, in the atmosphere of the Heian period Court, the seduction scene between the handsome poet Ariwara no Narihira, the most famous lover of his times, and the beautiful poetess Ono no Komachi. Narihira is finally turned away by the proud Komachi, who returns to her place. Narihira has to go back to his palace alone. "Narihira" is a short 15-min long dance.